ZixEncrypt offers policy-based email encryption and email data loss prevention to make securing your sensitive email communication easy. 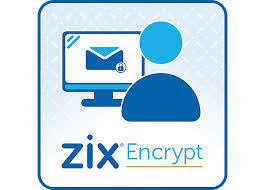 ZixEncrypt scans the content of all your outbound email and automatically encrypts based on policies you define. It automatically ensures compliance of your email communication without requiring special training or procedures for your employees. ZixEncrypt provides robust filtering technology that enables you to define and manage policy rules for protecting sensitive email content and ensuring compliance. Pre-defined filters are available for healthcare, financial, state privacy, education and more. Based on the email content you can determine if the email should be blocked, routed, quarantined or encrypted. Just as ZixEncrypt automatically scans your email, it also automatically determines the most efficient way to securely deliver your messages using our patented Best Method of DeliverySM. Through the Best Method of Delivery, encrypted email is delivered to anyone, anywhere and often transparently. Zix offers the industry’s only bidirectional transparent email encryption, enabling senders and recipients to exchange encrypted email without any extra steps. When you send an encrypted email to another Zix customer, the message and replies are encrypted transparently, so that not even a password is needed. On average, more than one-third of our customers’ recipients receive their encrypted email messages transparently. If you have ever tried to use TLS to secure email communication with partners, you are probably familiar with the manual effort required to securely configure and manage each TLS connection. 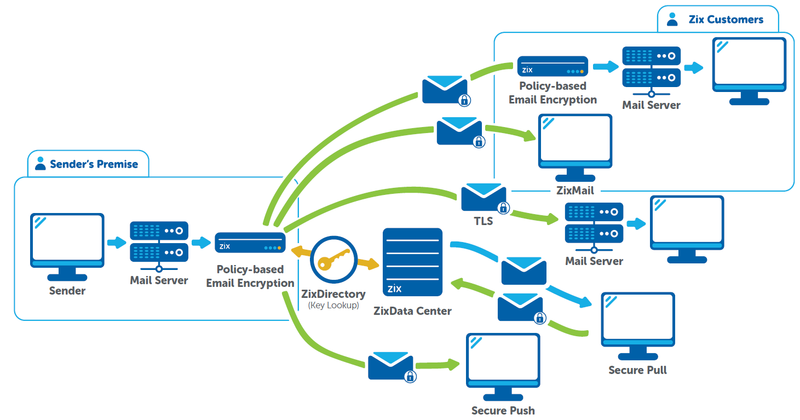 ZixEncrypt simplifies the set up and management of TLS by making it a part of your email encryption policies. By including TLS in a policy, you increase control and reporting visibility on your TLS encrypted email. ZixEncrypt lets you define the level of certificate authentication and encryption used with TLS, so you can improve security of your TLS connections. When using TLS, secure email is delivered transparently, further enhancing ease of use. Additionally, if TLS is not available, you can configure ZixEncrypt to fallback to an alternative delivery method to ensure the email is still delivered securely. When sending to recipients who do not have email encryption capabilities, ZixEncrypt offers you two different delivery methods – pull and push. The pull method offers a secure portal that makes receiving an encrypted email easy, even on a mobile device. You can also brand and integrate the secure portal into your corporate portal. The push method allows the email to be delivered directly to a user’s inbox as an HTML attachment. All of these options combine to create the Zix Best Method of Delivery, which automatically determines the most secure and transparent method of sending your message. If a policy is triggered and email is quarantined, a notification email is sent to the employee, employee’s manager and/or an administrator. Embedded in the notification is a link to review the quarantined email with highlighted violations. Depending on your preferences, employees and managers can release the email with justification noted or delete the email and draft a new version. If released, the email can be encrypted based on a user trigger or your policies.